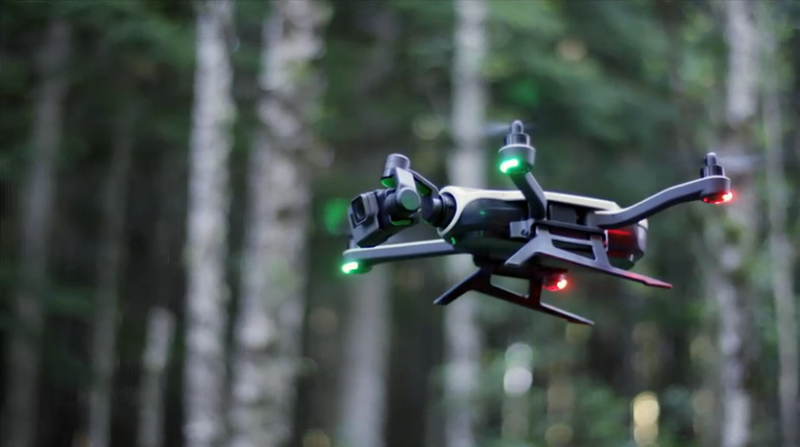 GoPro just announced its long-awaited (and long-delayed) flying camera platform: Karma. The folding drone comes in a backpack and features a removable stabilizer as well as a simple controller with a built-in display. It all costs $800 and will be available in a month. Nick Woodman, the founder and CEO of GoPro, made a big deal out of the Karma’s portability and versatility at an announcement event on Monday. “It’s so much more than a drone,” Woodman said approximately 3,427 times. He’s not lying either. The Karma itself is actually three devices: a quadcopter, a touchscreen controller, and a stabilizer that can be removed from the drone’s body and used as a steady grip. The stabilizer also attaches to existing GoPro mounts so you could strap it to your chest, go mountain-biking, and walk away with nice stable footage. (Woodman bragged about this functionality about a dozen times as well.) In terms of performance, the Karma boasts a maximum speed of 35 miles-per-hour, a range of one kilometer, and 20 minutes of flight time. Apparently, the backpack is so light you barely notice you’re wearing it. Looks very boxy, though. GoPro also built something called the Passenger app that effectively lets a second person control the camera while the pilot flies. Anyone who’s ever tried to capture the very best drone video while also trying not to crash the damn thing into a tree will understand how cool it would be to have a dedicated camera operator. GoPro didn’t go into too much detail about the various autonomous flight options, but it looks like they do exist. Pre-programmed options like a Dronie or an Orbit take just a couple of taps on the touchscreen display. It’s unclear if there’s a Follow Me function—although it would be insane if GoPro didn’t offer this to its adventure-loving customer base. The Karma will work with the new GoPro Hero 5 Black, the Hero 5 Session, as well as the Hero 4 and Hero 3. That $800 price tag only covers the cost of the Karma, controller, and backpack. GoPro is offering an $1,100 option with the Hero 5 Black bundled with the drone or a $1,000 option with the Hero 5 Session. That price point makes it a few hundred dollars cheaper than a Phantom 4 and about the same price as the Yuneec Typhoon H, which features six rotors, retractable landing gear, and a 4K camera. The stabilizer features a unique boom-style design, unlike competitors like DJI and Yuneec which use pistol grips. It seems obvious that GoPro is hoping that the versatility of the Karma system will make it stand out in the increasingly crowded drone market. The portability of a folding drone—DJI is rumored to be releasing its own next week—should play well with the action cam crowd. The built-in stabilizer—Yuneec released a similar product with the launch of the Typoon Q500 two years ago—provides some nice added value. And that controller does look beautifully simple. Of course, whether the Karma lives up to GoPro’s lofty promises remains to be seen. The drone starts shipping on October 23, and we plan to stress test the hell out of it. If it’s as versatile as it sounds, GoPro might just have a new hit on its hands.